March 3, 2017 By Chelsey Leave a Comment This post may contain affiliate links. Read my disclosure policy here. 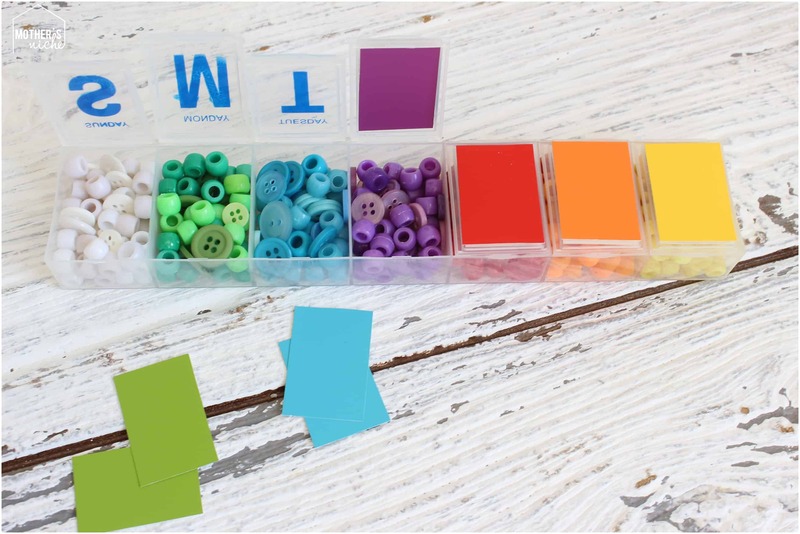 Want a fun and easy activity to teach color recognition and fine motor skills? For only $1? THIS IS THE BEST COLOR SORTING! Buy a weekly pill-box. I bought mine from the dollar store! SCORE! 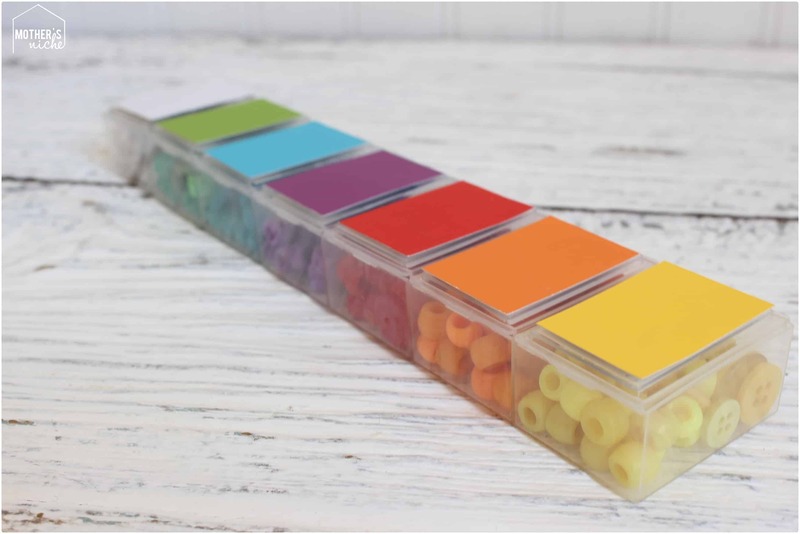 Cut out small colored papers for both sides of the pop up lids to cover the day of the week. Tape or glue in place. THAT’S IT! All that’s left is to fill each compartment. Fill is with little things you have around the house. You can spread everything out on the table and have your little one sort them all at the same time or color by color to help them learn the names. 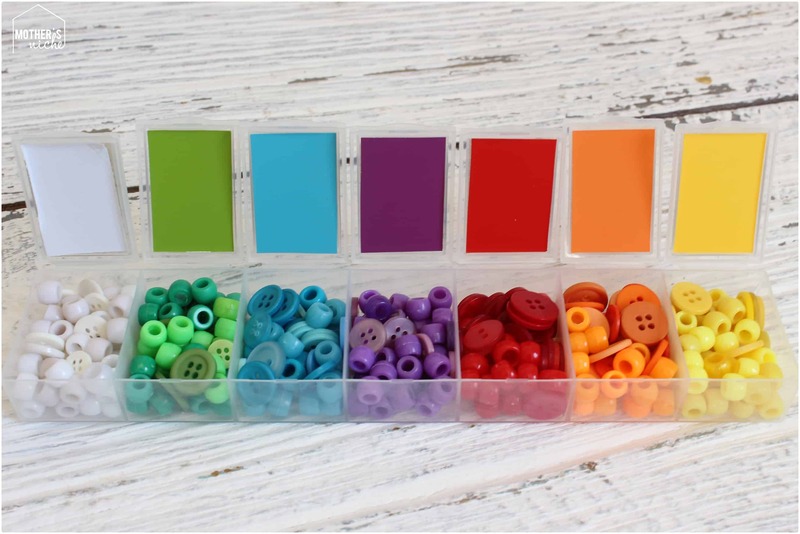 You can put different items (like buttons and beads) and have them only put one type of item in at a time. EX: When looking at the rainbow mess on the table ask: Can you please find the blue buttons? The red paperclips? The white beads? If that is too tricky dump and mix only 2 colors at a time. As their skills improve you can make games more advanced. It will really help them with fine motor skills to be picking up all those tiny items. BUSY BAGS have been so fantastic to have on hand in our home.I keep most of them near the kids crafting and creative areas in the house. These places include our library/playroom and the kitchen for playing at the table. It makes getting them out and helping them do the activities convenient. If you want to see more fantastic busy bags activity and printables click HERE! You will find everything you need to entertain your little ones! These activities take fun learning to a whole new level! You’ll love them! What are some of YOUR favorite color sorting activities? !